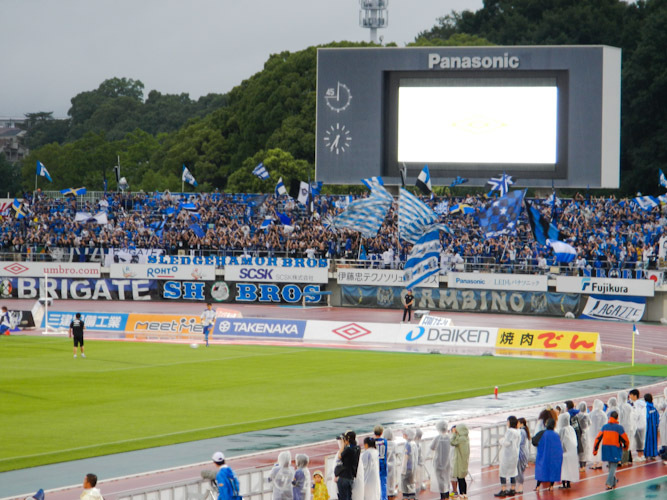 Osaka's local J-League Division 1 team is Gamba Osaka, and we were lucky enough to attend a home game while we were visiting the area. Hikaru, Nicole's friend and colleague from Carnegie, Washington D.C. had reserved tickets for us and after a day of touring the town we headed to the pitch, even as somewhat omenous clouds gathered above. One thing we really liked about the soccer experience in Japan is that everyone shows up to the field 2-3 hours early. This is mostly because the majority of seats are unreserved, and everyone wants a good seat. The part we liked was that to keep the crowd entertained, there were two youth matches leading up to the big game. You could tell that the kids were taking it seriously, and I was impressed with the level of play, especially from the under 11 squads. Waiting for the game to start was also made easier by the abundance of cheap food and beer (a can of beer was around $3.50 - cheap compared to the $8-10 beers at Toronto sporting events). Knowing that cheering for the home team is usually the way to go, we bought some blue PVC Gamba Osaka rain jackets, and sat in the home section. It turned out to be a lot of fun, because the fans there were quite devoted to their teams. The visiting section (red) was packed, which is impressive, considering that they would have all made the trip from Tokyo for the game. The game was quite good, and the level of play in J-League seems to lie well above the MSL and perhaps a little below the English Premiership. The devoted fans bouncing up and down and chanting their team's songs were probably the best part of it for us. We had enjoyed Toronto FC's super fans, but everything here just seemed cranked up a notch. 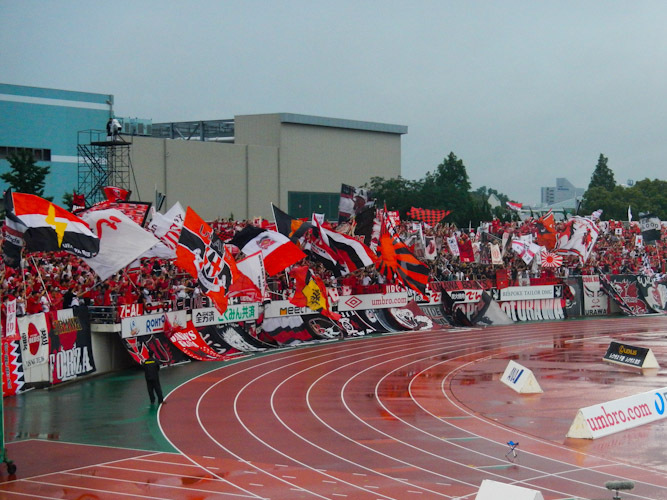 The crowd really came alive when Osaka went ahead in the first half, but after the Urawa Reds tied it up just before the half the away cheering section (below) really took over. The game was tied going into the second half, and the sky opened up and drenched the stadium, making anything possible on the slippery pitch. There were a lot of good chances on both sides, and I have to hand it to the referees for letting the players decide the game, despite many somewhat borderline spills on the wet pitch. A minute into injury time, both teams were slowing down, frustrated and waterlogged no doubt. Unfortunately for the home team, an Osaka defender slipped while making a pass and the Urawa Red Diamonds capitalized on the opportunity. 2-1 for Urawa was the final score... The official game report can be found here.